Developer: Tommy Visic And Co. I don't really know where to start with my review for Glace, I feel rather intimidated writing a review for what I consider one of the greatest freeware game of all time. The story is set in a far away galaxy inhabited by a number of strange alien creatures. The game starts with 2 mad scientists, named Dr. Frog and Dr. Slagg, as they try to create a creature that will help them control the universe. Experiment number 4,286 is a failure, all the mad scientists are able to create is a small, cute, blob creature. The scientists order that the creature is destroyed but something goes wrong and our soon to be hero escapes. 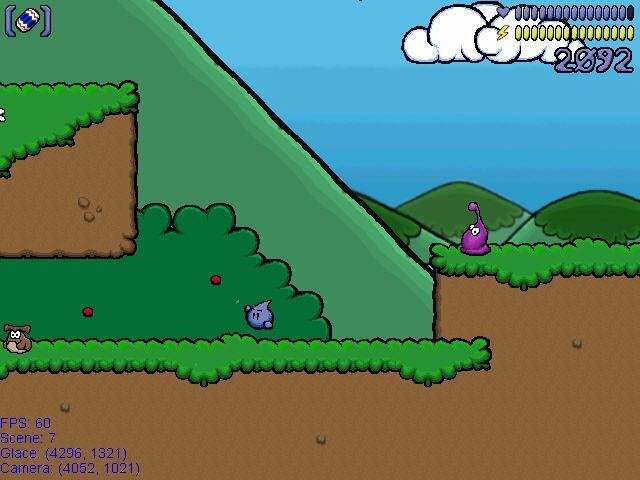 The game follows the adventures of our blob as he aims to prove that he is more than just a failed experiment. His adventures take us through 4 distinct platform environments. 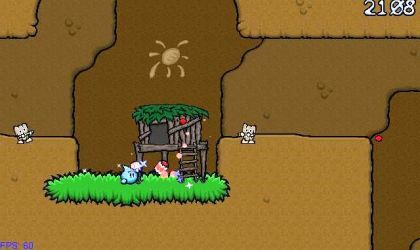 Each environment features unique scenery and new enemies. Our blob has a few of his own abilities including wall bouncing and super jumping. Both of these are useful skills when it comes to getting around but his true power comes from the magical beads that he finds (and every one else wants). These beads are Glace's only offense. He throws these beads at his enamies but because of their mystical magic powers they are attrackted back to him, ready to be thrown again. The first is the balancing of the games appeal to both young and old. 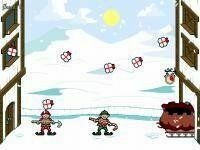 The cute characters in the game will keep the younger audience entertained. The gameplay is challenging enough to keep older gamers in front of their keyboards but it should not be too difficult for younger players. The second balancing act is story line to gameplay. The ever present story line will keep you attached to the characters but you wont be bored with endless cut scenes and dialog. The third balancing act is multimedia to download size. The music and graphics in this game are phenomenal. The original music creates a very fitting atmosphere and the unique raphics are crisp, clean and interesting to look at. Despite all this multimedia the creators were still able to keep the game under 5MB. I can't think of any good words to accuratley describe how amazing this game is. All I can say is hats off to the creators. You all did a really wonderful job in creating a truly amazing side scrolling platform adventure game for both young and old. Glace is a simple platform game with pretty good presentation - the graphics are some of the nicest I've seen in a platformer before, the sound effects add to the style of the game, and the music is varied - some tunes work well, while others get a little repetitive. Unfortunately, the gameplay is pretty standard. Walk forward a bit, hit an enemy a few times, wait and heal if the enemy somehow managed to hit you, continue. Although there are many reasons to keep playing, including the simple plot, some of the more interesting boss battles, and some small secrets and unlockable features, the majority of the game completely lacks fun. 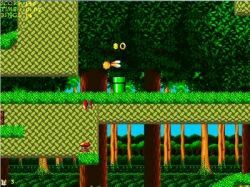 The game has few levels spread out over 4 different zones, and each level is just far too long, with a lot of empty space, or pointless areas which require the player to just keep bouncing until they can reach a platform. 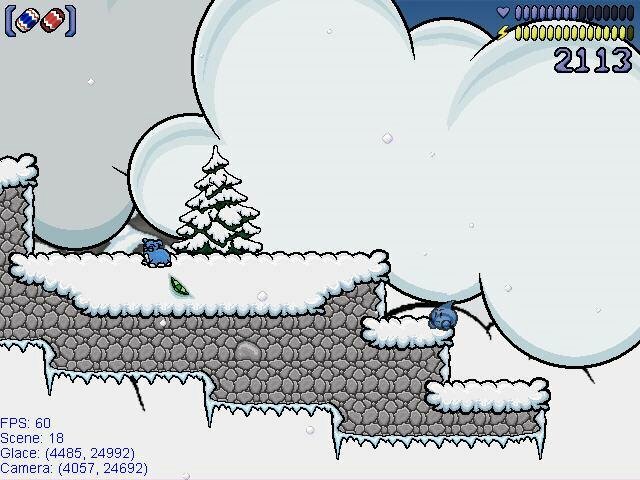 I have no idea why these areas even exist, other than to show off the graphics or the fact that Glace can bounce. Glace is certainly suitable for more casual players, but serious gamers should stick with Zeux's World. Awesome, simply awesome. I remember downloading this game from another website, and I had to remove it for some reason later on, and when I tried to download it again it kept telling me the file failed to save, unfortunately this still happens but I still thought I should write a comment from my past experience with the game. Glace is a truly fun game, it's very addictive, and has awesome graphics. One of the best things I liked about Glace is how you use those beads and get to throw them at an unsuspecting monster then pick it up again, and getting to upgrade Glace is just as cool! And on top of this, you get to learn awesome abilities, and watch tones of entertaining cut-scenes. Glace is definitely one of the best games out there. This game exceeded even the high expectations set by the review. Every bit of it is a complete blast, the characters in the story were funny and engaging, and the gameplay was really fun. I like the way the magical beads rebound. The only problem I had with it was that some of the levels were really hard. 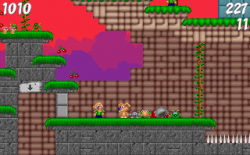 The levels get pretty long near the end, and there's no checkpoint system to save mid-level. It's really frustrating to get all the way to the last part of a level, die, and have to start over again. For the most part, though, I found it to be a really fun and rewarding experience. A good game for all ages - fun, easy to learn, and captivating enough that you'll want to play until the end. 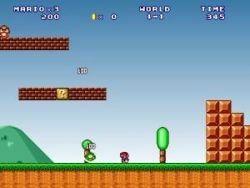 It has gameplay similar to any other platformer (i.e., run, walk, jump, attack, few special moves + bonuses etc). but the concept of the magic beads acting almost as boomerangs is really a stroke of genius. I would classify it as being easier than most mario-type games that I have played, but, being freeware, Glace is really quite a gem. Just amazing. This game is a must. I'm just amazed to see how the creator re-invented plataform games by doing Glace. It's fun, the gameplay is terriffic so you just won't stop playing until you reach the end. When you think you're done with it you'll see that you can play it all over again with "different Glaces". 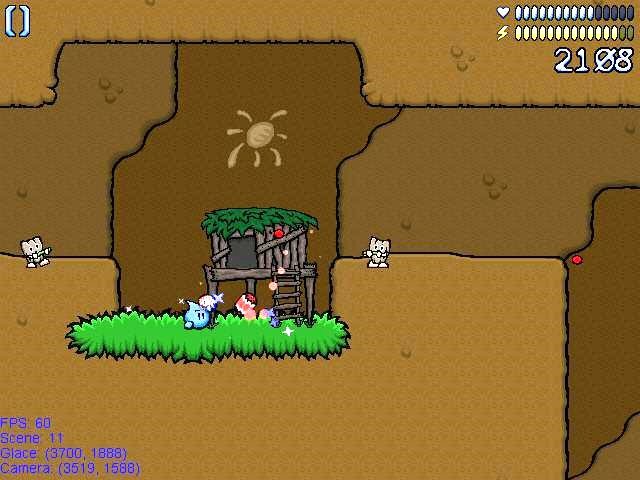 Besides all, the whole game is cute enough for kids and somewhat challenging for the grown ups. The graphics and story are solid and the game play would be great except one serious problem - no joystick support. Platformers need twitchy reflexes, even on a game like Glace which has fairly laid back play. The keyboard is very clumsy for this style of game. 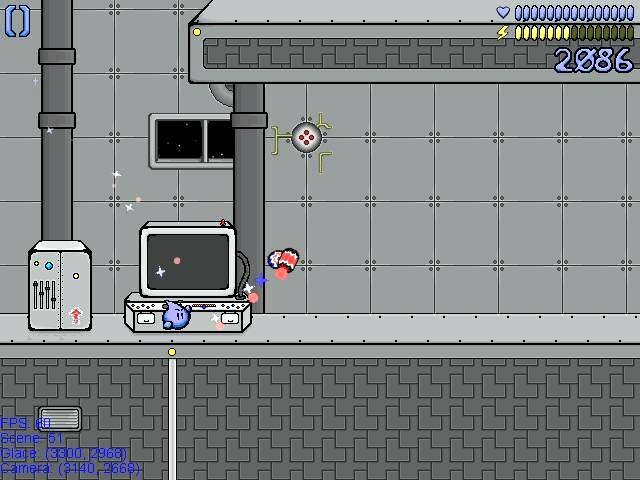 I highly recommend JoyToKey if you want the most out of Glace.